Easier to use, cut and trim. Unbeatable flexibility even down to -20°C. Will also provide a degree of impact reduction. 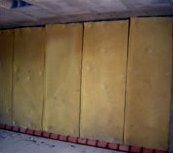 are a polymer-based, asphalt-free, high density synthetic soundproofing membrane, that offers good acoustic insulation in different building elements. It has extremely high visco-elasticity as well as being extremely flexible even in cold temperatures. This material has excellent sound insulating properties. Many construction materials and techniques do not provide enough damping. Rigid sheet materials such as plasterboard absorb little sound energy becuase they tend to vibrate and re-radiate sound on the other side quite effectively. 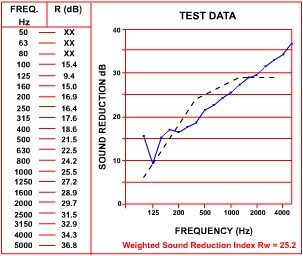 Tecsound acoustic membrane however has tremendous density and mass whilst being extremely 'limp', its acoustically better than lead of the same surface mass, so will help absorb sound energy far more efficiently. Whilst some systems rely on visco-elastic glues to provide 'damping' the results achieved will vary greatly on the application of the glue. Is it too thick ? is it too thin ? has it been applied evenly and consistantly ? (PLEASE NOTE): 1m² of material covers approx. 0.9 - 0.95m² allowing for overlaps). When stapled over frameworks it greatly improves a lightweight partitions overall performance. When bonded to lightweight resonating metal panelwork it greatly reduces vibration and re-radiated noise. Combined with sound-absorbent materials, it offers products with high acoustic performance. 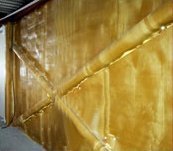 Its applications in the industrial field cover from the soundproofing of booths to the acoustic insulation of machine-rooms, gutter pipes, sound-damping of metal sheets, etc. The material has a reinforcing scrim facing on one side. When stapling over a framework you want the scrim side facing you. When laying on a floor have the scrim side facing you. When using multiple layers you will may find the material will want to tack to itself so keep scrim side against brown side. When sticking in-between plasterboard stick the brown side to the first board. Important: The material itself remains flexible down to -20°C; however the adhesive backing on the adhesive backed version (SY50) will degrade if left in temperatures approaching zero. Test Certificate Applus 4.042.669 above shows test data for the Tecsound 50.